Apparently I mistakenly clicked something and now the summary info section is gone from my Run window's Test results. The output pane is ok; it's just the handy statistics (overview of red/green by test name) and left-hand pane treeview are gone. Fiddling with Test toolbar didn't seem to help. I also don't have the associated buttons for those two panes. 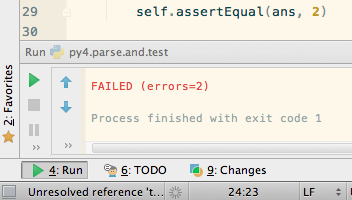 Restart of pycharm does not change the loss. It was working earlier however. it seems that you just run the script file instead of tests configuration. Please, check that you selected the proper run configuration. For more information about PyCharm run configurations, please visit webhelp page. Thank you Ekaterina! I thought there was something wrong with my configs. After your reply I found this screenshot that also helped alot. Then I deleted the config that was merely running my item and changed a default test runner's config to use /folder/ instead of just one file. Now I have the nice right-click menu and also I get my tests.